Add a thin coat of brown sugar on top of the bacon. After 10 minutes, remove cookie sheet from the oven. Use tongs to “flip” bacon. Continue baking another 10 minutes. Now take the cookie sheet out and baste the sugary syrup over the strips of bacon. Return to oven another 10 minutes and check. For a crispy result, flip it again after this last check and let it bake yet another 10 minutes. For a gummy-bacon result, remove from oven at this time. 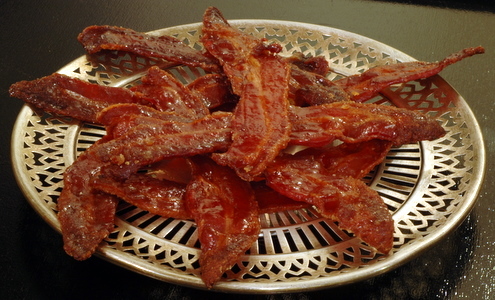 Place strips of bacon on parchment paper or wax paper. If desired, cut into bite size pieces.